MWH Medical Pte Ltd ("MWH Medical" or "the Group"), a leading homegrown medical group, and Siemens Healthineers are pleased to announce the launch of the first Asia Reference Center through their partnership. Guest-of-Honor, Deputy Prime Minister and Coordinating Minister for National Security, Mr. Teo Chee Hean will be officiating the grand opening of the multi-specialist medical center at Royal Square, Novena. MWH Medical and Siemens Healthineers Partnership Opens Doors for Clinical Advancements in the Healthcare Sector. This partnership is a testament to the long working relationship between MWH Medical and Siemens Healthineers. Both parties will develop a Center of Excellence with the long-term objectives of ensuring better disease management and improving quality of patient care. With the rise of chronic diseases prevalent in Asia, the Centre will allow both parties to embark on partnerships to meet the enormous clinical interest in diagnostic advanced imaging. Through their shared efforts and cooperation, global experts from Siemens Healthineers will leverage MWH Medical's facilities and state-of-the-art technology to drive training programmes and educate both local and regional medical practitioners. Together, both parties will continue to expand healthcare services in ensuring better disease management and improving overall patient outcome. Siemens Healthineers will establish its first-in-the-region, Asia Reference Center at the newly-launched MWH Medical Center. The Center will serve as a touch point to other regional medical facilities and to introduce Siemens' latest medical innovations and technology in Asia. This strategic partnership will pave its way as the region's main healthcare hub and cater to the challenges medical practitioners face in managing higher expectations around convenience, customization and overall experience. The partnership will seed a new set of considerations in seeking growth amid an industry in transformation. MWH Medical housed the region's first 3T Magnetom Vida MRI machine that incorporates artificial intelligence with its BioMatrix Technology, the 3T MRI machine conducts faster examinations and produces results with higher resolution for better image quality and accuracy. The technology caters to the specific needs of each patient, while also delivering consistent, high-quality and personalized examination results that prevent unwarranted variations in imaging results, allowing MWH Medical to achieve improved medical precision and deliver better patient care. The regional medical landscape is still fraught with underdeveloped infrastructure, fiscal constraints and shortages of medical professionals and equipment. In line with Singapore's Smart Nation drive, we recognize that advancements in technology is needed to address growing medical concerns. With our strategic partnership with Siemens Healthineers, and in line with Singapore's Smart Nation initiative, we want to digitize the healthcare experience for both patient and caregiver by improving the speed and efficacy in delivering care to patients. Doctors and patients alike will now be able to access their medical information remotely via the MWH app, and patients will now be able to participate in a tele-collaboration with experts from around the world together with their consulting doctor, reducing the need to even leave the country,"
Dr. Michael Lim, Medical Director of MWH Medical. "The rise of the digital economy has had a profound effect across industries, eliciting varying degrees of adaptation. With one of the best healthcare systems in Asia and the world, setting up Siemens Healthineers' first Asia Reference Center in Singapore together with MWH Medical was an amicable decision to make." "We are aligned in wanting to achieve the best outcome in healthcare delivery, and with the support of MWH Medical we look forward to providing Asia with greater access to the latest, world-class innovations in medical technology with precision medicine and transforming care delivery," said Ms Siow Ai Li, Managing Director, Singapore, Siemens Healthineers. MWH Medical's strategic partnership with Siemens Healthineers is a win-win for the state of healthcare in the region. 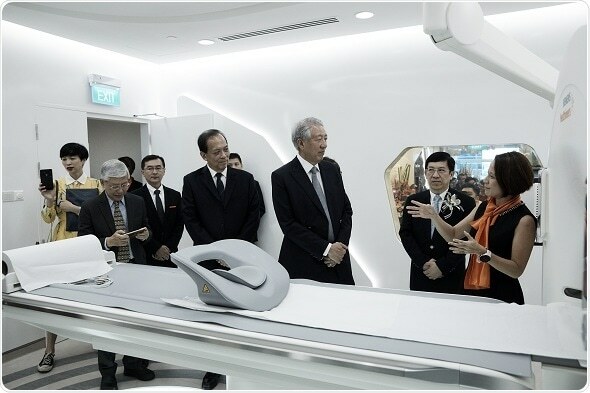 Being able to meet the healthcare needs in the region through this partnership with Siemens Healthineers' state-of-art technology, will help to enhance the status of Singapore as a regional health center for high quality health care."